Gladys B feels as though her life has been "transformed", after ten years of poor bladder control when all her journeys outside the home were governed by the availability of a toilet, which she was likely to need in a hurry. First signs of improvement began within a week of starting to use the PelvicToner, and after one month, the improvement was "incredible". "I never went out shopping or on holidays without a supply of incontinence towels. Now, I can take my granddaughter for a walk and I don't have to worry how far I go. I feel I have my life back again." Bladder surgery failed to solve the problem; pelvic exercise cones were relegated to the bottom of a cupboard as the problem failed to clear. "I was always restricted in where I could go and always had to wear an incontinence pad. I was terrified of having an embarrassing accident." The problem was so distressing that she felt she had become "old". She took to buying dark clothes which were less likely than lighter ones to show any telltale marks. "It was affecting my whole life." Gladys and her husband were even considering using their life savings on private surgery in America. Now, they can go on holiday to new resorts, instead of only to Blackpool, where they know where the loos are. I don't have a problem now. After using the PelvicToner on most days since September (2001), "I don't have a problem," Gladys B says. "The other week, I took my granddaughter aged 41/2 to school and we actually ran." This had previously been impossible because there was on public lavatory on the route. "I am looking forward to skipping with my grandchildren." 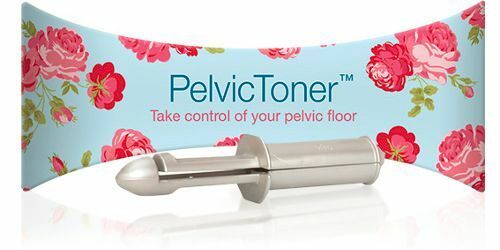 "To say the Pelvic Toner is marvellous is an understatement. It is absolutely brilliant. It is incredible. I can't praise it highly enough." "In September, I saw this little piece in my local paper, the Hartlepool Mail, about the trial of the PelvicToner and I sent off to be on it. My letter was in the post within hours. I didn't think I would be one of the lucky ones." "I couldn't believe how quickly it worked. It started to work within the first week. I kept it to myself because I thought my mind was playing tricks on me. I didn't believe that in a week I could see a difference, but it was true. It was incredible." "I had a bladder repair four years ago. Everything went well for the first three months, and then very rapidly I was straight back to where I was in the beginning. I was really desperate not to have another bladder operation." An earlier hysterectomy - needed for other reasons - had failed to stop the urinary incontinence. After the bladder repair surgery, Mrs B was given a leaflet by the hospital on pelvic exercises, "but nobody explained them. I tried doing them, but do not know whether I was doing them properly or not." "I felt a bit silly inserting a finger, but you got the rhythm of how your muscles inside were working, so when you inserted the little gadget, you knew you were just following straight on, and that is how I quickly got the benefits." "We always like Blackpool for our holidays and it has become a family joke because I have all the toilets mapped out there, and once I felt the need, I knew where to pop in to. But I always carried a spare pair of knickers and a couple of towels in my handbag. I never went anywhere without them for about ten years. Now, I've got three packs of incontinence towels in the wardrobe that I'll never use." "When I wakened in the morning, as long as I lay in bed I was all right. The minute I touched the floor, I had to rush straight to the toilet and sometimes I was leaking before I got there. That used to cause me real distress. My husband used to say 'Nobody knows about it but me' but it was still distressing and depressing." "Now, if I go on holiday and want to keep up with my exercises, this little gadget is so neat that I can pop it in my handbag and nobody would know it is there. We went on holiday to Whitby, Yorkshire, to celebrate my birthday. I went to the toilet at 8.15 a.m. before we left the house and it was 2.15 p.m. before I went to the toilet again in our hotel room. When I told my daughter, she couldn't believe it. She said 'Mam, you have never been able to go that long before'." "I said I'm just thrilled to bits. On Saturday, we went to York for the day, and I had no problems whatsoever. It is incredible that such a little gadget can make such a difference to my life." "The change in my life is unbelievable."